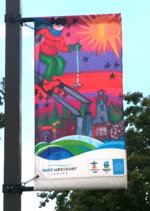 A few months ago, the New Brunswick shop had put together a marketing campaign targeted to campgrounds. 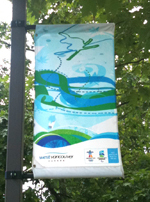 Part of that included a spiffy header image of a tent and three flags flying above it. 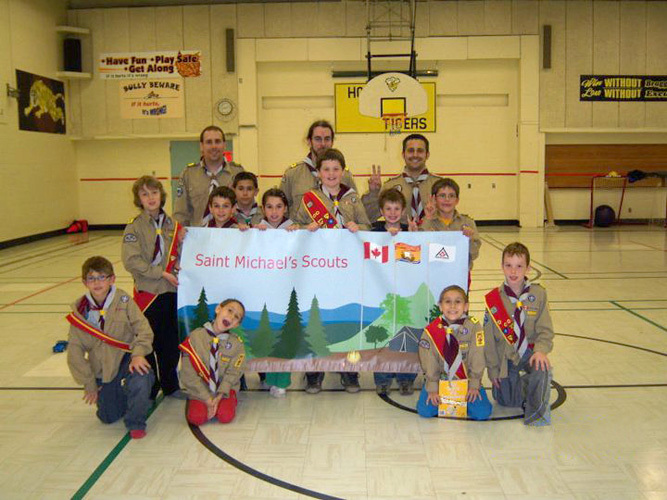 Originally the three flags were Canada, New Brunswick, and Acadia, but after the St. Michael’s Scout troop saw it, they thought it would be great with the Scouts logo in place of the Acadian flag. Since we live to accommodate, we made a new version of the image just for them which was then printed on vinyl for their troop. They look pretty happy with it! Canuck flags are bigger than ever! 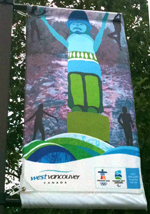 Comments Off on Canuck flags are bigger than ever! Here’s something to raise your spirits after last night’s… well, let’s not even talk about it. Friday night, after everyone had left for the day, Susan got a request for some extra-large Canucks flags from The Fairmont Hotel Vancouver. 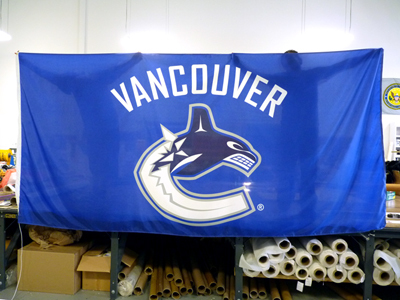 We carry a fair number of Canucks flags (well, usually… we’re a little low at the moment), but not in 6’x12′. The hotel forwarded the email correspondence showing they had permission to have extra large Canuck flags made – a rarity, since most people love to tell us they have permission, but when pressed, can’t prove it. Susan double-checked with the Canucks, and after receiving an email confirmation, put the paperwork together on Saturday. Monday morning the order went into production, and a mere 26 hours later, we have this beautiful 6′ x 12′ Canuck flags, which will be up and flying soon along with two other 4.5’x9′ flags. 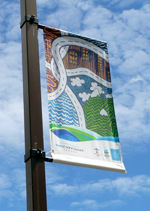 You are currently browsing the The Flag Shop Blog blog archives for June, 2011.